We have got another beautiful picture of Naga Chaitanya and Nidhhi Agerwal from the sets and they look adorable together. Actor Akkineni Naga Chaitanya has geared up for his interesting upcoming film, Savyasachi, which is being directed by Chandoo Mondeti. The actor will be seen romancing actress Nidhhi Agerwal in the film. Well, the team has headed to New York for the shooting of final schedule of the film. Recently, we got some on sets pictures of the stars and now, we have got another beautiful picture of Naga Chaitanya and Nidhhi Agerwal from the sets and they look adorable together. The picture only makes us wait to catch sizzling chemistry between them onscreen. 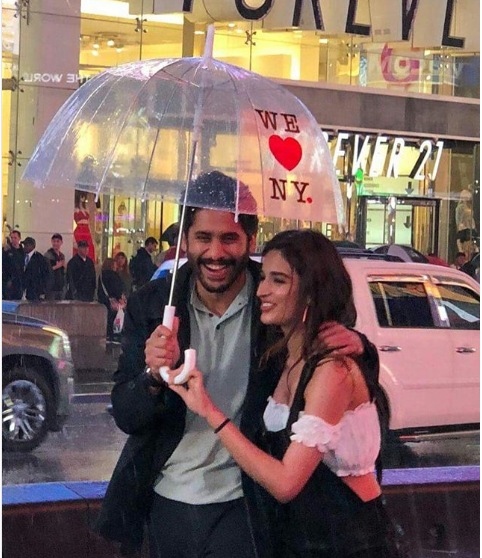 Here’s a picture of Naga Chaitanya and Nidhhi Agerwal shooting for a romantic song in New York. The picture sees them sharing an umbrella and a laugher moment. The photos from the movie set are my photos and are being used here without my permission .